Corpusty Black Mill was one of two windmills and one watermill owned by Samuel Goldsmith. Little is known about the structure apart from the fact that it had a roundhouse. 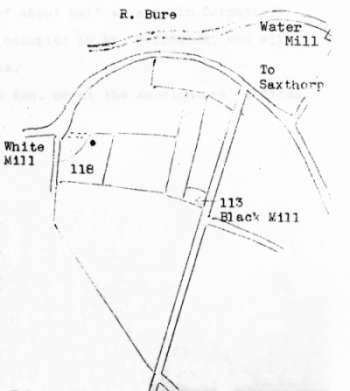 The first known record of a windmill in Corpusty was in a deed dated 1671, where a windmill was referred to as being in Saxthorpe. Owner & Occupier Samuel Goldsmith Snr. No. 1: Water Mill & Premises. Pasture 0a. 1r. 39p. No. 2: Home Meadow. Pasture 1a. 3r. 32p. No. 113: Black Mill. Pasture 0a. 1r. 0p. No. 118 White Mill. Pasture 1a. 0r. 7p. 3a. 2r. 38p. = 16s. 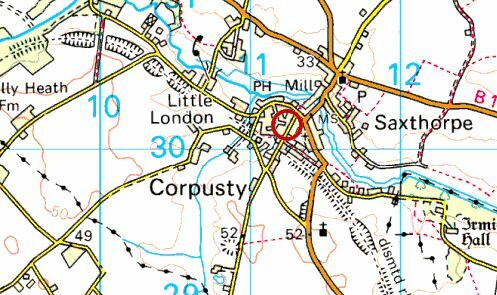 In the 1970s an elderly resident remembered standing on the remains of the Black Mill's roundhouse in order to watch the first train draw into Saxthorpe & Corpusty station on 5th April 1883. CLOWES & FLOWERDEW are favoured with instructions to Sell by Auction at the Norfolk Hotel, Norwich on Saturday 25th August 1860 at 3 for 4 o'c. Lot 1. That excellant Watermill, Residence, Stable, Warehouse, Meadow Land, & Post Windmill all in Corpusty doing a capital home trade. The above is all Freehold & occupied by Mr. Goldsmith who will give possession at Michaelmas. There were two other postmills in Corpusty, one known as the White Mill, that lay the the west of the Black Mill and another postmill that lay to the southeast of the village near the river. All three appeared on Bryant's map of 1826. The 1851 census lists the miller as being Henry A. Massingham (38), who was a master miller employing 2 men and two boys. One of those boys was his nephew Samuel Goldsmith, who at the age of 16 in the 1851 census was already described as a miller. Samuel was living with his uncle in Corpusty. Robert Richmond was also working there with his son John, who was 12 years old but by 1861 Robert Richmond had moved to Briningham postmill.